Mayfields Retreat in Newsham, near Richmond sleeps 2 people. Mayfields Retreat in Newsham is located in the grounds of the owners’ home. Mayfields Retreat is the perfect location for guests who want to really relax, unwind and enjoy a quiet romantic break without the usual interruptions of day to day life. 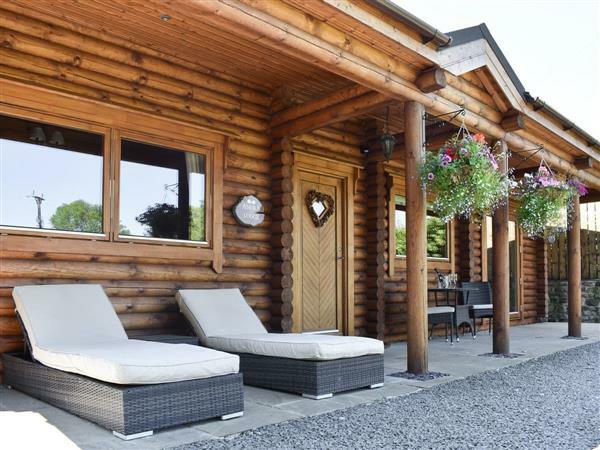 Ideally situated for couples wanting to pamper themselves and make use of the private hot tub and comfortable surroundings of this log cabin. Mayfields Retreat has been well decorated and furnished to a very good standard, the living room is comfortable and cosy with wooden floors and a wood burner. Situated in the quiet village of Newsham, on the edge of the Yorkshire Dales, this is a wonderful base to really explore and get to know the local area. Walkers and cyclists are drawn to the area, with many established footpaths, bridleways, and cycle paths that lead through the village and further beyond into the magnificent countryside of North Yorkshire. The local pub is only a short walk away and offers good quality food and local produce. Perfect for a day trip are the National Trust properties, located within a 10 mile radius are Moulton Hall and Braithwaite Hall. Eggleston Abbey, Bowes Museum, Barnard Castle, Bowes Castle, Raby Castle can all be reached within a 15 mile radius, and offer guests the chance to explore some of the many historic attractions of the area. Teesdale and the famous High Force waterfall is also a popular attraction in the area. Richmond is just 7 miles away with its golf course, and offers top quality restaurants, pubs, tea shops, cafés and bistros, or visit the weekly market, monthly farmers market, or the Georgian Theatre Royal. Barnard Castle has a golf course, which is 7 miles away, and Catterick Racecourse just 10 miles away for guests who enjoy a sporting occasion. Local farm shops within a 3 mile radius. There are spa treatments available. The shop is 3 miles from Mayfields Retreat. With the pub and restaurant being 1 mile from Mayfields Retreat. All on ground floor: Living room with wooden floor. Dining room/kitchen with wooden floor. 1 double (5ft) bedroom with en-suite shower room and toilet. Wood burner in living room (initial fuel included). Oil central heating, electricity, bed linen and towels included. Travel cot. 32 Freeview TV. DVD. Electric cooker. Microwave. Washing machine. Fridge/freezer. Wi-Fi. Lawned garden with enclosed decked sitting-out area, patio, terrace and furniture. Gas barbecue. Parking (2 cars). Hot tub. Welcome pack. No smoking. Holidays at Mayfields Retreat in Newsham run from Holidays run from Friday to Friday. For a better idea of where Mayfields Retreat is, you can see Mayfields Retreat on the map below. Mayfields Retreat is in North Yorkshire; should you be on the lookout for a special offer, you can find all the special offers in North Yorkshire. It's always worth checking to see what is on offer at the moment. Do you want to holiday near Mayfields Retreat (30448), you can see other cottages within 25 miles of Mayfields Retreat; have a look to find your perfect holiday location.